Wholly owned subsidiary of La Macarena SA, distributor of Piper Aircraft Corporation (q.v.) products in Argentina. Chincul manufactured Piper aircraft from 1972 including Archer, Arrow, Aztec, Turbo Aztec, Chieftain, Dakota, Pawnee, Cherokee, Cheyenne, Navajo, Seneca, Super Cub, and Warrior. Signed agreement with Bell Helicopter Textron 1990 for helicopter co-production. Direccion Nacional de Fabricaciones e Investigaciones Aeronauticas originally founded in 1927 as the Fabrica Militar de Aviones (FMA) (q.v.) for aeronautical research and production. Became Institute Aerotecnico in 1943, Industrias Aeronauticas y Mecanicas in 1953. Nationalized 1957, with aircraft works at the Fabrica Militar de Aviones at Cordoba, under DINFIA name. Began with design and construction of IA 46 light aircraft, twin-engined transports IA 35, IA 45, the IA 38 four-engined tailless transport designed by Dr. Reimar Horten, and the IA 37, a small delta-wing aircraft. In 1966 began license construction of Cessna 182 and indigenous light turboprop and piston-engined transports. 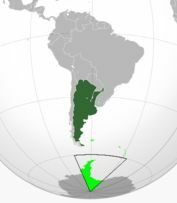 Reverted to name FMA in 1968, becoming part of Area de Materiel Cordoba division of the Argentine Air Force. FABRICA MILITAR DE AVIONES SA ==> next FMA. 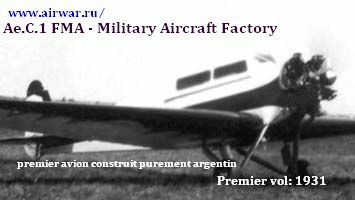 FMA (Argentine) FABRICA MILITAR DE AVIONES SA Fabrica Militar de Aviones SA established at Cordoba 1927..
FMA 7 I.Ae.27 "Pulqui" I.A.33 "Pulqui II" I.A.38 I.A.50 "Guarani II" I.A.53 I.A.58 "Pucara" I.A.63 "Pampa"
Industria Metalurgica e Plastica SA, a munitions factory, opened an aircraft department in September 1941. A new factory opened at Quilmes Airport, Buenos Aires, in December 1944. Products included prototypes of RR-11 two-seat low-wing cabin monoplane (1942) and Chorlito light single-seat trainer (1943). Only production aircraft was the Tu-Sa (or LF-1), of which 25 were built 1943-1944. RACA began assembly of Hughes 500C helicopters in 1975 under license. A minimum of 120 helicopters are to be built. Builder of J-1 Martin Fierro single-seat agricultural monoplane with 300 hp Lycoming engine. Prototype first flew in 1975 and a small batch produced. First design by Ing Alfredo Turbay was the T-1 Tucan parasol- wing lightplane, first flown April 1943. Six Tucans ordered from Sfreddo & Paolini (q.v.) were halted when the latter firm was seized and nationalized by the government and plans to revive production in 1963 were also thwarted. The T-2 five-seat twin-engined monoplane was destroyed by fire in early 1949 before it had flown; thus the next design to fly was the T-3A six-passenger light transport in December 1964. Turbay SA was formed in January 1961 to build the proposed T-3B production version and a lengthened fuselage development, theT-4, but no production was achieved. Le premier vol officiel en Argentine. The forbidding Andes Mountain range made Argentina an attractive destination for flight pioneers from other countries and a challenge for the country's own people. The first Argentinian manned balloon flights, mainly with French aerostats, occurred in the second half of the 19th century, but it was not until the first years of the 20th century that the frequency of those flights increased. On 24 June 1916, E. Bradley and Capt. A.M. Zuloaga flew over the Andes in a flight that started in Santiago, Chile, and ended in Argentina's Uspallata Valley. The flight took a little more than three hours and reached an altitude of 8100 meters. It was the first flight over the Andes range. Argentina's first officially recorded flight of a vehicle heavier than air was made by the French pilot Henri Brégi on 6 February 1910, during the centennial commemoration of Argentina's May Revolution of 1810. The celebration included several planes and pilots from France and Italy. Brégi flew a biplane Voisin with a 60 CV engine, reaching an altitude of 60 meters and a speed of 53 kilometers per hour. In 1912, Teodore Fels used a Blériot to accomplish the first crossing of the Rio de la Plata, joining Buenos Aires with Montevideo, Uruguay. Fels flew back to Buenos Aires the following day. The following year, the German pilot Lübbe, in a Rumpler Taube with a 110 CV Argus engine, set the world record flight with a passenger over the water, flying from Buenos Aires to Montevideo. Flying across the Andes range was an obsession for the Argentine aeronautical pioneer J. Newbery, the passenger in that plane, and it prompted him to improve the altitude world record. 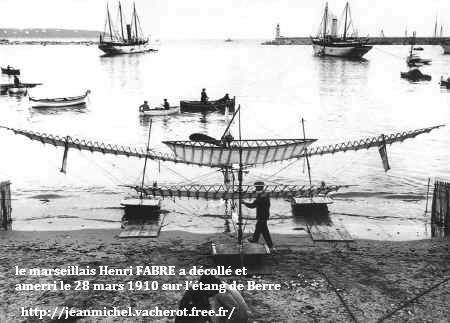 On 10 February 1914, with a Morane Saulnier aircraft powered by a 80 CV supercharged engine, he reached an altitude of 6225 meters, exceeding the world record by 75 meters. However, Newbery crashed and died without accomplishing his goal of crossing the Andes. That accomplishment went to 1st Lt. L. Candelaria on 13 May 1918 in a Morane Saulnier (Parasol) with a Le Rhone rotary engine of 80 CV. However, Candelaria flew to the south, where the mountains are lower. The crossing over the highest peaks of the range was performed on 12 December 1918 by the Chilean pilot D. Godoy, who flew a Bristol airplane equipped with a 110 CV engine. Two years later, the Argentine V. Almandos Almonacid made the first night flight over the Andes in a Spad aircraft with a 220 CV engine. Almonacid also carried out the first night bombing mission for the Allied Forces during World War I. The first planes to fly in Argentina came from France, and some were used as models for the first Argentinian planes. In 1910, P. Castaibert began the construction of the first Argentine airplanes, but production was interrupted when, because of World War I, he couldn't import the engines he needed to complete them. The Castaibert planes were used for exhibition and school, and later were the first planes used by Argentina and Uruguay's air forces. Two of those planes are now in the Museo Aeronáutico of Uruguay. In 1924, Raul Pescara, an Argentinean working in Paris, built a coaxial helicopter with biplane rotors and achieved a record by flying 736 meters. He was one of the first to recognize the autorotation phenomenon, and he also achieved control of the flight through cyclic-pitch change, obtained by warping the blades periodically as they rotated. For more than 65 years, the biggest aeronautical development and production center in Argentina was the Fábrica Militar de Aviones in Córdoba, an inland city 700 kilometers from Buenos Aires. The company first built airplaces (1929) and engines (1930) under license and later began building its own planes. The first national plane conceived and produced was the Ae.C.1 (April 1932), a three-seated passenger plane with a covered cockpit. In August 1947, the first flight of the IA-27 (Pulqui I), a jet fighter designed and developed in Córdoba by a team led by the French engineer E. Dewoitine, took place. It was the fifth jet fighter in the world and the first built in Latin America. The Córdoba factory employed other European professionals, particularly Germans and Italians, to work with Argentineans on military and civilian projects, including flying wings, swept wing fighters, small- and medium-sized passenger transports, and general purpose aircraft. However, most of these projects only reached the prototype stage. Aero-commercial operations in Argentina began on 10 June 1919 when a company founded by S.H. Kingsley made flights between Buenos Aires and others cities in Argentina and Uruguay. The first passengers were taken across the Rio de La Plata on a De Havilland plane. Kingsley's operation flew 8750 kilometers until financial difficulties forced him to close operations. His place was soon taken up by other companies, such as Aeroposta Argentina, founded in September 1927. Aerospota began regular flights in January 1929 with Breguet 14-A-2 and Laté 25 airplanes. The opening of aero-commercial routes in Argentina was made by intrepid men battling against a hostile environment and precarious logistical support, especially in Patagonia.